The latest edition of Great Plains's vertical tillage implements is the Turbo-Max, a machine that traces its linage back to the original Turbo-Till introduced in 2002. The Turbo-Max has two coulter gangs, like previous Turbo-Till models, but with 7.5" spacing between each blade it has 25% closer blade spacing per gang. The two off-set gangs are designed so the second gang splits the first – sizing residue to under 4". Also, the Turbo-Max has the ability to angle the gangs hydraulically on the go from straight to 6 degrees, depending upon whether the operator wants to select an angle to actively bury residue in the fall, or prepare a straight vertically tilled seedbed in the spring. 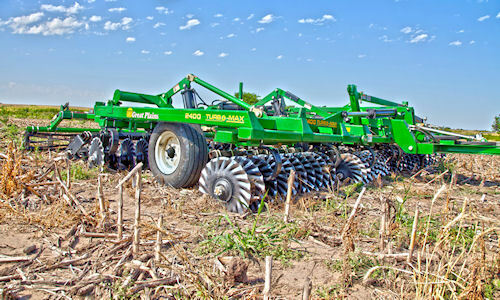 Turbo-Max from Great Plains is the evolution of the company's first Turbo-Till models, but outfitted completely as a modern vertical tillage machine. The finishing attachment behind the coulter gangs is the company's patented rolling spike harrow which levels the soil and fractures any soil not already loosened by the coulters. For more information on the Turbo-Max, call (785) 823-3276, or visit www.greatplainsmfg.com. ­­­­­­­­­­­­­­­­­­­­­­­­­­­ By "clicking" here, you've indicated an interest in the latest in agricultural technology, and we'd like to provide you with even more of What's New in the power-tech industry. To receive our bi-weekly e-newsletter on trends and developments in machinery and ag technology click here POWERIRON to join thousands of readers who receive our updates free of charge every other week.